The Association of Women Lawyers, Malaysia: A role model for us nearer home, Dato' Ambiga Sreenevasan. I was particularly inspired by her courage and her words, “Gender equality is a responsibility of all Malaysians,”. About the Author: Ruth Bennett serves as the Public Affairs Advisor for the Office of International Women’s Issues. This entry is one in a series of profiles of the 2009 International Women of Courage Award recipients. 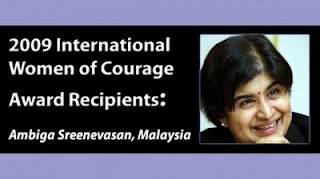 Malaysian Bar Council President Dato’ Ambiga Sreenevasan is a high-powered, high-profile advocate for good governance, democracy, and human rights. Elected in March, 2007, Dato’ Ambiga is the second female Bar Council president in that organization’s history. Six months after assuming her leadership, she organized the “March for Justice,” in Malaysia’s administrative capital, calling for judicial reform and investigation of a tape allegedly showing a key lawyer fixing judicial appointments and judges’ case assignments. Her public actions, and an intense lobbying campaign, led to a Royal Commission and a finding of need for corrective action. Dato’ Ambiga has also consistently supported the rule of law during her tenure, condemning the politically-motivated arrests of two journalists, and the government’s banning of an ethnic Indian activist group and arrest of its members. Dato’ Ambiga’s most controversial work is in the areas of religious freedom and women’s rights. She has assertively confronted sexism in Parliament, taking her case directly to the public when necessary. “Gender equality is a responsibility of all Malaysians,” she wrote in a press release that protested a politician’s patronizing remarks. She successfully fought to amend Malaysia’s Federal Constitution to ensure that women’s testimony would carry equal weight to men’s in Shari’a courts. She continues to fight for the religious freedom of women who convert to Islam upon marriage. Under current law, these women are not allowed to return to their original religions on dissolution of the marriage, regardless of the reason for its termination. As a result of her attempts to find legal solutions to issues that continue to generate inter-ethnic tensions and constitutional problems, Dato’Ambiga has received hate mail, death threats, and had a Molotov cocktail thrown at her house. Hundreds of people from religious groups and conservative members of government have protested at the Bar Council building and called for her arrest. In a country with a potentially volatile religious and ethnic mix, Dato’ Ambiga has courageously persevered in seeking answers from within the rule of law, and worked relentlessly and energetically for that legal and governing structure to be made more transparent, accessible, and equitable to all." hello, i am muslim i have question. This question i feel that have to ask you. 1. The question is, is a syariah law unfair to non muslim? And please don't take it serious, i just wanted to know your opinion. 2. Is a muslim in this contry unfair to other religion?